Did you hear the one about Emory's mascot? Instead of an eagle, it should be a crane. That's the joke circulating the past few years among Emory students. Yes, we've all seen the Jurassic Park-sized orange towers looming over Fishburne, Dowman, and Dickey drives, and currently they are nesting on Clifton Road. Their perch at Emory is temporary, but their effect will have far-reaching implications for learning and discovery for the students, faculty, and staff on the university's campuses. To see what's lasting and the goal of all this digging and lifting, take a stroll on Tuesday at lunchtime outside Cox Hall. There at the weekly farmer's market is a cross section of the university -- sophomores on skateboards, doctors in scrubs, faculty in khaki, administrators in suits, graduate students deep in discussion (nursing and public health students say, "it's what lures us over the bridge"). The market has become a campus magnet, serving needs that go beyond getting nutrition to nurturing community. Common wisdom these days is that the market is the place to go if you want to run into someone "accidentally." The site, however, isn't an accident. A decade ago, the location was a busy roadway that bisected the campus. 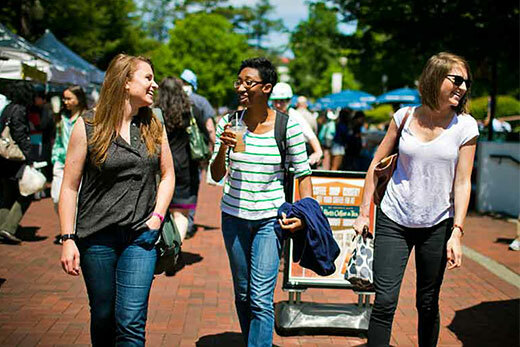 In the years since, the Campus Master Plan has transformed Emory into a pedestrian-friendly, sustainable campus, with indoor and outdoor spaces that draw people together to facilitate communal and intellectual life. President James Wagner, in his introduction to the master plan in 2005, identified three guiding principles: superb stewardship of the natural environment, advancement of the community's intellectual life, and enhancement of the quality of life for students, faculty, staff, and Emory's neighbors. An integral complement to the strategic plan, Where Courageous Inquiry Leads, the Campus Master Plan has created the physical space for Emory to realize its vision to become a destination university. "Developed through extensive conversations with faculty, students, and staff," says Emory trustee and alumnus Laura Hardman, "the master plan has respected the past while looking to the future. The beautiful pedestrian campus knits together the university, supporting multidisciplinary learning amidst green spaces fostering reflection and well-being."